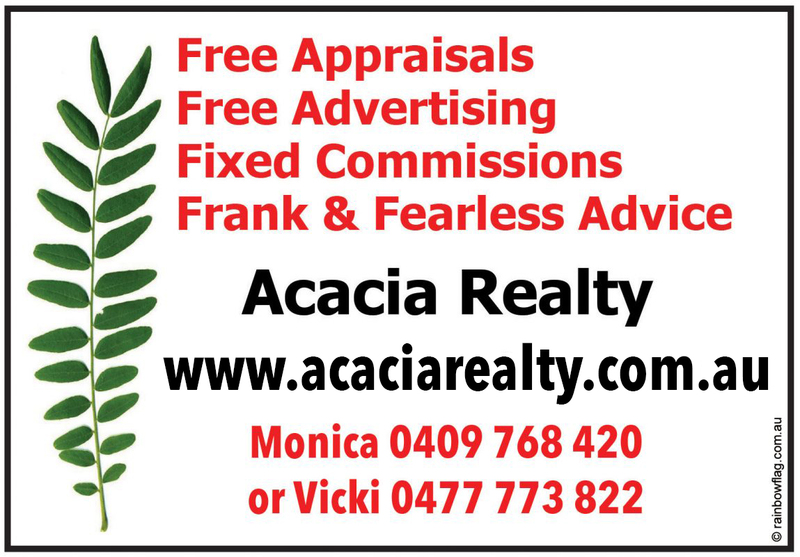 Acacia Realty is your LGBTI friendly real estate agent in the Territory. Whether you’re looking to buy, sell or rent Acacia Realty is here to help. Acacia Realty commenced operations in early July 2014. Acacia Realty is a boutique firm ready to provide the very best service to all clients offering free appraisals, fixed commissions and free advertising together with frank and fearless advice. We service Darwin, Palmerston and specialise in Rural areas. As the owner operator and principal, Monica, started the business and operates from Acacia Hills. Monica has a breadth of knowledge including sales, property management, developments, and experience in subdivisions having had many years of experience in housing new and old Territorian’s. Her goal is to provide frank and fearless advice & a honest, reliable service every time. Acacia Realty undertakes both Residential and Commercial Sales and Rental’s including property management services. Thank you for visiting the page of Acacia Realty as part of the Rainbow gay friendly network. Acacia Realty is located in Northern Territory and are happy to assist the gay and lesbian /lgbti community when looking for Real Estate. Acacia Realty is proud to be part of the rainbow flag Australia network and can be contacted on 0409 768 420.